How about being able to control the PlayBook tablet device using your BlackBerry smartphone? Well, such a scenario is all set to unfold later this month when we would be getting version 2.0 of the BlackBerry PlayBook OS. So while native e-mail, contacts and calendar apps along with support for some Android applications are some of the missing features that would be part of upgrade package, there already are reports of something more coming our way. 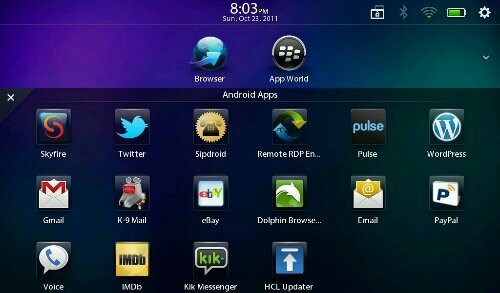 Like the BlackBerry Bridge software that was used to pair a PlayBook with a BlackBerry Smartphone is also being updated. What makes this special is that the new software would make the phone as a remote control for the tablet. What this means is that one can show a presentation on the PlayBook display screen using the BlackBerry as the tool to move the presentation. One would also be able to use the keyboard on the Smartphone to type on the PlayBook screen. Further, there would also be the possibility of sharing photo between Blackberry Smartphone and the tablet without the need to transfer the file in real time. Sounds too tempting? Thankfully, we won’t have to wait too long to get to the bottom of it all as the upgrade is set to be launched this month itself. The Playbook already has a superb presentation function – allowing HDMI out while using the tablet to control powerpoint or run other apps or presenter to read notes (and doesn’t require separate phone) This new functionality would only enable a small presentation, eg one on one salesman to customer at home. I’m still looking forward to the update though!